Even if you’ve never created a pivot table before, this book will help you leverage all their amazing flexibility and analytical power. In just the first seven chapters, you learn how to generate complex pivot reports complete with drill-down capabilities and accompanying charts. 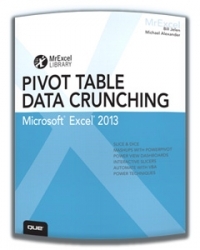 Then, you go even further, discovering how to build a comprehensive, dynamic pivot table reporting system for any business task or function... Read More inlcuding the Table of Contents for this publication. Pivot Table Data Crunching: Microsoft Excel 2010 - The MrExcel Library.